Today is the worst day ever. Everything just happened all at once. First, i forgot to bring my earpiece. So no music for me on the way home. It was still okay. Then, i realized i didn't bring my keys either. So i thought, it's okay, i'll just ask mum to help me open the door when i'm home. But of course i didn't blame my mother. It was, after all, my fault. I didn't bring my keys. It's all my fault. So i sat outside my house like a lost puppy, waiting for my mother for 2 hours. I just sat there and was watching some dramas on my iPhone (thank God for my iPhone) then i realized there were blood stains on my skirt. But no, i was not on my period. Even that would be better cause i was sitting down. But no, my nose was bleeding. Okay, i guess i sort of expected myself to bleed. Cause my nose has been bleeding frequently the past 2 weeks and i don't even know why. When i started bleeding, i cupped my nose with my hand. BUT IT NEVER STOPPED BLEEDING! It just kept dripping and dripping. AND THEN I REALIZED I RAN OUT OF TISSUE PAPER!!! In a way i'm glad my neighbors decided to keep their doors closed so they won't faint when they see me. 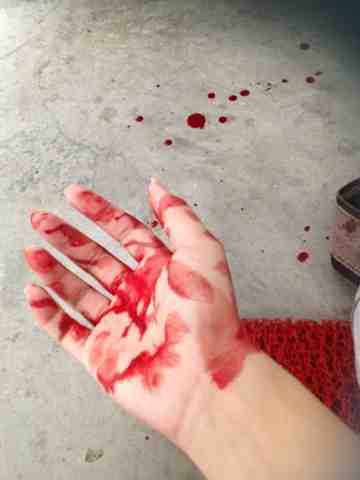 There was blood everywhere and it seemed as if i just murdered someone lol. My macbook. My poor, precious macbook. I couldn't log in at all. No, i still can't log in! I don't even know why!!! Now i'm like stuck with windows. Sigh..
Oh, and did i mention that my mousepad went crazy too? I can no longer double click. But something miraculous happened. It worked again! Hahaha!